The United States has spent so long trying to supplant Cuba’s communist dictatorship with liberal democracy that surely, after more than five decades, it has exhausted its policy options. It tried to overthrow the Castro regime in 1962. It tried to assassinate Fidel on multiple occasions. Most enduringly, it has severed all diplomatic and economic ties with its neighbour some 90 miles south of Florida. One would think that, after failing so long to achieve its objectives, it is time for the U.S. to change its approach. Impassioned as they may be, these and other embargo hawks who vehemently object to lifting the embargo have not proffered any explanation of how prolonging the embargo will improve conditions under the Castro regime. Former Governor Jeb Bush (R-FL) remonstrated that “we should instead be fostering efforts that will truly lead to the fair, legitimate democracy that will ultimately prevail in Cuba”, despite not articulating a single policy alternative that might achieve that end. By reflexively and dogmatically opposing any Castro policy by virtue of its origin, embargo advocates are insisting the unattainable perfect be the enemy of the good. It is high time to realise that a grand revolutionary moment is never coming to oust the Castro family from power. Democracy will not march down from Sierra Maestra, but will grow over time as the seeds of economic freedom germinate. Whether he knows it or not, President Raúl Castro has ventured Cuba forth on the arduous road to democracy. Since assuming the presidency in 2006, Raúl has made GDP growth a priority, enacting modest liberal reforms including the relaxation of constraints on private property and industry. These aberrations are representative of a recent trend in Havana: the Communist Party envisions a market economy going forward. At the 2011 Communist Party Congress, it formally adopted a comprehensive plan to transform Cuba’s Soviet-style command economy, loosening central oversight of state-owned enterprises, eliminating universal subsidies, and allowing more small business to participate in the means of production. Freedom House notes that these economic reforms have yielded an improvement in civil liberties, with Cuban consumers allowed greater access to goods and the introduction of a state-sponsored campaign against homophobia placing Cuba as a standard-bearer for the LGBT rights movement in Latin America. While the rest of the world stands to gain from the recent, unanimously-passed law designed to attract massive foreign direct investment, the U.S. self-inflicted policy of isolation shutters its companies from a burgeoning market and, more importantly, continues to prevent itself from leveraging its status as regional hegemon into influence in Havana. Economists project that a full repeal of the embargo could net the United States as much as $4.3 billion annually, primarily in the agricultural sector. Cuba would surely be asymmetrically dependent, importing more from the U.S. than it would export. In addition, as long as the embargo persists, Castro will continue to exploit it politically, blaming Cuba’s problems on the United States to rally support for the regime and further justify the repression of political opponents and the media. Although purported to punish the Castro regime for their human rights violations, the embargo economically marginalises ordinary Cubans by helping the regime consolidate control over the economy, keeping the people poor, oppressed, and disenfranchised. The most potent weapon in the U.S. policy arsenal is economic engagement with positive conditionality. In the past, the U.S. has successfully leveraged bilateral aid to both pursue its regional security interest and project “soft power”, making American values more attractive to aid recipients. After World War II, the Marshall Plan helped rehabilitate European economies and contain the spread of communism. Today, the U.S. has programmes like the Millennium Challenge Corporation, which awards bilateral foreign assistance to states that have made strides to improve three broad categories: “ruling justly”, “investing in people”, and “encouraging economic freedom”. Offering development aid in exchange for political and economic reform ought to be the first step toward bringing Cuba into the IMF, World Bank, and Inter-American Development Bank. However, no efforts to integrate Cuba into the neoliberal economic global order will gain traction in Havana so long as Congress insists upon regime change. President Castro’s acknowledgment that Cuba needs an economic relationship with the largest capitalist country in the world is not a “communist victory”, but the realisation that Cuba’s command economy is doomed in absence of a patron. Castro’s economic reforms, as well as his insistence on term limits, suggest that a regime shift (as opposed to a regime change) may be on the horizon in Havana, wherein the domestic political structure is deliberately altered to preserve the ruling position of the family and their cronies. Castro’s triumphant address to parliament in December framed the diplomatic reconciliation as an affirmation of Cuban sovereignty predicated on mutual respect for each country’s political and economic systems, although tacitly acknowledging that some market-oriented reforms are needed to grow the Cuban economy. As Raúl Castro looks to appoint a successor in 2018, the United States needs to grasp this opportunity to socialise the present regime to the ideals of civil liberty, democracy, and free enterprise. Progress may be painfully slow, but will inch in the right direction. From the U.S. perspective, how can any purported drawbacks to engagement with Communist Cuba worsen either U.S.-Cuba relations or the living conditions of the average Cuban? Cuba’s human rights record is abhorrent, but there is no reason why that should preclude the U.S. from diplomatically and economically engaging with it. Strategic relationships with China and Saudi Arabia exemplify that humanitarian concerns are second-order priorities, and rightfully so. The embargo was justified during the Cold War, when Cuba was a staging ground for Soviet military instalments. Today it is an anachronism, an unwarranted policy of economic warfare toward a country that no longer poses a strategic or ideological threat to the United States. Ending the embargo immediately will yield the U.S. favourable economic and diplomatic dividends in its neighbourhood and accelerate Cuba’s languid pace of domestic reform. The recent killing spree at the University of California, Santa Barbara, in which six people were murdered (three by gunshot, three by knife wound) and others were injured prompts an important and valid question: “how many more?” Although gun violence is on the decline in the United States, awareness of it, fostered by the Information Revolution, has increased to the point that the American public thinks it occurs more than it actually does. That’s not to say it isn’t a serious issue which merits national attention. #NotOneMore — an advocacy campaign designed to mobilise the public to write their elected representatives in favour of gun control laws — answers that question. Popular sentiment regarding the urgency of addressing the problem crests and falls as killing sprees come and go, and is more or less split into two camps: public health advocates and gun control advocates. They agree that the government must do something to stem these violent outbursts (which is to assume that the government is capable of improving the status quo). For adamant defenders of the Second Amendment, the natural choice appears to be in support of making the gun violence issue about mental health. However, this runs aground of evidence to the contrary. A disheartening op-ed by a former Harvard Medical School psychiatrist reveals that allocating more funding to mental health treatment is unlikely to alleviate the United States’ spree killer problem for a number of reasons. Many of the recent murderers, whose names are now ingrained in the country’s collective consciousness, had been under psychiatric treatment. (Note: it is my belief that mentioning mass killers by name glorifies the actor, exacerbating the problem by inspiring similar acts. As such, I avoid doing so). If mental health funding is not the solution, perhaps legislation is. 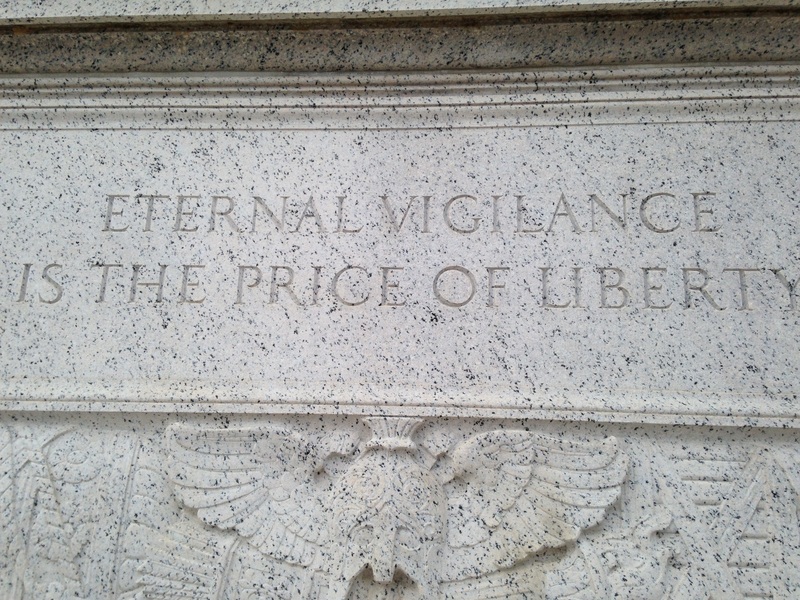 Etched into his Memorial, Thomas Jefferson’s words merit consideration. Is the Second Amendment a relic? Some gun rights advocates have displayed outright callousness to UCSB victims’ families, saying “your dead kids don’t trump my Constitutional rights”. Such a view sees the Constitution as an end-in-itself, which it is not. The Constitution tacitly accepted mass enslavement; it is not infallible. However, the Constitution’s flaws are the exception, not the rule — no codified set of principles has ever sustained a country for so long. The Constitution exists to protect citizens from government that would infringe upon their principal natural rights, which are the right to property, freedom of contract, first possession, self-defence, and restitution2 or, more poetically, “life, liberty, and the pursuit of happiness”. Gun control purists who believe that society should be disarmed suffer from faulty assumptions about human nature, a myopic view of history, and a naïveté about the future. They aren’t really anti-gun, they just believe that only the government should have guns, or at least that the average citizen is a threat to society for owning a firearm capable of inflicting the kind of mass carnage found in war. The Founding Fathers shared none of these delusions; they recognised that individuals in positions of power, being self-interested, expand their authority and power for personal gain, coming at the expense of the citizens. They also understood that once rights are voluntarily conceded, they aren’t regained. A disarmed American public would leave a concentration of unchallenged coercive power in the hands of the government. Any entity with a monopoly on violence is a threat to a free society. There’s an elephant in the room. We need to talk about the Second Amendment for what it is. Prudent laws are not made for political expediency or to “do something”. We are immeasurably fortunate to not bear the shackles of tyranny upon our wrists today, but let us not be so arrogant to think that despotism could never occur on these shores — not today, not likely in our lifetimes, but if you watched The Hunger Games and dismissed it as an impossible fantasy, its message was lost on you. American democracy is not guaranteed; it must be actively cultivated and preserved. The survival of liberal democratic institutions and norms in the United States requires that The People remain its custodians. Comparing the rate of gun violence in the United .States to the rest of the developed world is problematic because the American historical experience is unlike any other. The U.S. is the world’s longest continually-established democracy.4 The second-longest was forged by comparable processes, making for an interesting parallel. Amid the liberal Revolutions of 1848, Switzerland emerged as a new, unified state in the wake of a civil war. Its Constitution of 1848 transformed the country from a loose confederation of cantons to a federal parliamentary republic; modelled after the U.S. Constitution, it reserved powers to local jurisdiction in similar fashion. Lacking a national firearm registry, the Swiss are allowed to keep military-grade weapons at home, rights they reaffirmed in a 2011 referendum in which a 20-6 majority of cantons and 56.3% of overall citizens rejected tighter gun control measures. Switzerland also joins the U.S. at the top of the list of firearms per person, yet has one of the lowest homicide rates in the world. The case of Switzerland illustrates that owning automatic firearms bears no necessary correlation to violent crime. Perhaps, to paraphrase Winston Churchill, the dramatic difference in gun violence is a matter of how our institutions shape our society. The most glaring difference is in the foreign policies of the two. Switzerland has been officially neutral since its declaration was issued and recognised in the 1815 Treaty of Paris, while the United States’ involvement in international conflict has been prolific (to put it mildly), lately in search of dragons to slay. What makes Americans such a violent lot, compared to the rest of the developed world? Theories abound. It may be the case that our formative experience has left us with unique scars. If there is one singularly salient locus, it’s extremely difficult to pinpoint, but whatever it is, it’s so deeply embedded in “American-ness” that I doubt it’s a problem that can be legislated away. China, where guns are illegal, has a similar problem of violent knife attacks. Yes, it is easier to spray bullets into a theatre than it is to stab the same number of people. But robust gun control would undermine an important aspect of democracy without addressing the matter of what makes Americans especially prone to wanting to kill so many innocent victims. Violent people are violent people before they have committed an act of violence. How many more people have to die in mass murders before we start treating our family and friends with compassion, and strangers with respect and decency? The Palma ratio measures income inequality, comparing the world’s richest 10 percent with its poorest 40 percent. Economists at the Center for International Development have concluded that the middle 50 percent (i.e. the middle class) is stable across all countries surveyed, while the distance between the wealthiest and poorest grows. Further, the countries with less income equality than the US are all in the Global South. Americans don’t handle not being the best well. But rather than immediately lament the US rank, one must consider whether more income equality is something worth having. Income inequality between the rich and the poor is a natural growth; social elites are the best-educated, most well-connected, and healthiest individuals in any society and are able to maintain these resources by “hoarding” opportunities.1 Income equality, however, can only be created through government policies designed to make everyone equal. Such policies have natural order all backwards — man ought to be equal under the law, despite being unequal of ability. When considering that the state’s proper function is to establish justice, it would seem that the only form of taxation which perfectly realises the universal virtue of justice is a flat rate. Unlike progressive taxation, the flat tax treats citizens as legal equals — whether taxes are low or high, in a just government, everyone pays the same share. The United States’ Palma ranking is right where it should be*, and is indicative of the country’s uniqueness. The US features 132 companies on the 2013 Forbes Global 500 list, substantially more than any other country. The top five are rounded out by China (86), Japan (62), France (31), and Germany (29). The US is still a place where, by and large, the best have the greatest chance to succeed, in a way not present in countries with greater or less economic equality. Living and studying in The Netherlands, I’ve observed a general complacency among the Dutch not found in The States. University tuition fees are heavily subsidised by the government, so Dutch students pay only €1,835 per year for tuition. Whereas the high cost of studies in the United States pressures American students to graduate on time or early, Dutch students, lacking a financial burden, have less urgency to do the same. To a greater extent, the tax system contributes to a complacent society — households annually earning upwards of €55,695 pay a 52% income tax rate. The Dutch welfare state provides such a breadth of services and taxes at such steep rates that it produces a largely unmotivated, hunger-less society. Dutch people know that they’re all going to come out approximately the same in life, so why should they work hard? That attitude is reflected in OECD data from 2011, which shows that the Dutch work fewer hours per week than anywhere else in the world, at 30.5. The system itself disincentivises innovation, as evidenced by the mere twelve Dutch companies among the Fortune Global 500. Social mobility, not income equality, is what we ought to value. However, it needs to be considered in relative, not absolute, terms. Absolute social mobility considers one’s income compared to his parents, whereas relative social mobility considers that, and also frames it within the gains of everyone else — a class rank, if you will. Absolute mobility can grow for everyone as the economy expands, and relative mobility is a zero-sum game — when someone climbs the ladder, someone else slides down a chute. This is often lost in the discussion, given the link between upward social mobility and the American Dream. I know what it’s like to take the slide. In the late 1990s my father lost his job (justifiably) as an executive at a multi-billion dollar defence contractor and my life became a lot harder after that and my parents’ divorce. There were immediate impacts, like switching to public school and moving from a six-bedroom house to a townhouse, as well as future consequences, such as difficulty affording my undergraduate and graduate studies. Am I happy this happened to me? Of course not, although it has played a role in my character development. However, I recognise that it is important for members of the upper and upper-middle classes to backslide and thus make upward mobility possible. Regarding income inequality, the United States is between two undesirable extremes. China, whose wealth is disproportionately held by elites, has a largely poor population, and a GDP per capita ranked 87th, despite its nominal GDP ranking 2nd. At the other end of the spectrum, France has a relatively classless society because of punitive tax rates, which subvert the natural order of humanity, inhibit growth, extend state power, and create income-based legal distinctions among citizens. Aristotle’s doctrine of the mean, that the moderate choice between two vicious and opposite extremes is the most virtuous, indicates that the United States is right where it should be with regard to global income equality. Although there is one supreme and perfect form of justice, it, like all universals, does admit of degrees. Justice in economic policy must prioritise outcomes over intent. Even though it does create legal distinctions among citizens, progressive taxation — that is, temperate progressive taxation — enables the greatest number of citizens to live comfortably. This utilitarian approach is not a Marxist attempt to bludgeon the wealthy and erase class existence, but straight from perhaps the greatest American to ever live. In a letter to James Madison, Thomas Jefferson suggested that a “means of silently lessening the inequality of property is to…tax the higher portions or property in geometrical progression as they rise”.4 Jefferson was concerned that without this variety of progressive rate, the political foundations of the Republic would be in jeopardy, as more and more wage labourers, dependent on proprietors with an egregious concentration of wealth, would have their political and economic autonomy eroded. In a state which (moderately) takes a greater share from some individuals than others, the legal distinctions among citizens are real, but are nominal when compared to the potentially deleterious effects of a flat tax. Arguments for a flat national income tax based on theoretical appeals to justice can only amount to hypothetical posturing; no elected officials in a representative government would pursue such, whether because of held principles or concern for expediency. You want to lower taxes on the wealthy and raise them on everyone else? Good luck with that. Even if that did happen, the state’s noble intentions would foreseeably contradict my positions that A. social mobility is important (for an economy and a society), and B. that, in the United States’ case, the country is approximately where it should be with regard to income equality (and thus shouldn’t take drastic steps in either direction). If everyone in a given state pays a 25% annual income tax, that one-fourth of lost income does more to damage the quality of life for a wage-earner than a 33% rate would harm the well-being of someone north of the 90th income percentile. A high flat income tax would stagnate and calcify socioeconomic status, contributing to the “sticky floor” that renders upward mobility increasingly out of reach, the poorer one is. Depending on your perspective on tax policy, either flat or progressive taxes could be seen as just. Here we find that policy which aims toward justice and has ends which justify the means. An appeal to temperance, as used to consider income equality, reveals that the most just form of income tax is a softly progressive one, and partakes more in moderation than in European practice. Everyone’s weighing in on the Washington Redskins’ nickname — what started in the media and at the grassroots level has sprouted upward, and has been addressed by political talking heads, NFL executives, NFL owners, and even President Obama, who remarked that “Redskins” is offensive to Native Americans. No word yet on if he thinks Apache, Black Hawk, and Iroquois helicopters or Tomahawk cruise missiles similarly offend. Opinions are cheap — everyone’s got one. In an attention economy like ours, having an opinion is a means by which people can trade something that costs them nothing to produce (opinions) for tangible benefits (a paying career). Professional trolls Skip Bayless and Jason Whitlock are prime examples. 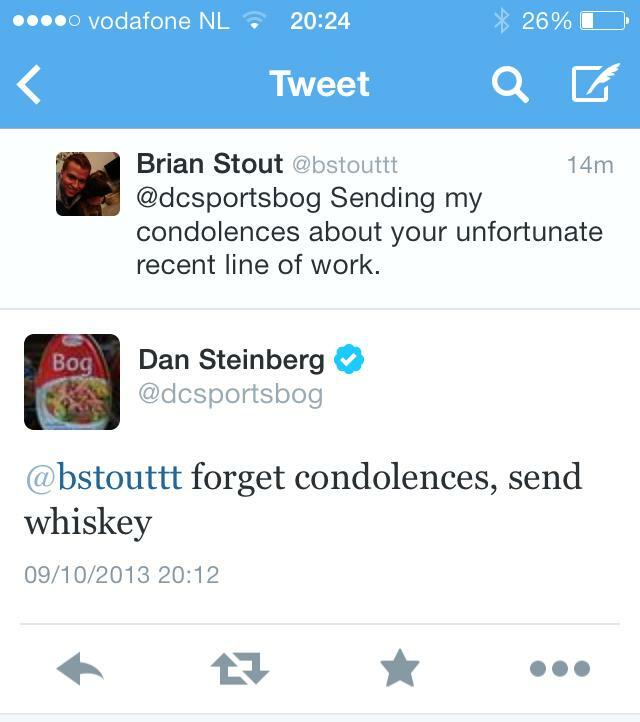 I’m only articulating my viewpoint because I’m a nobody (for now) and Washington Post sports blogger Dan Steinberg won’t have to write an article about me. With the Nats and United out of the playoffs and basketball and hockey season yet to begin, the poor man has become consumed by Redskins nickname-mania. I must disclose that I was born and raised in the DC area and have always been, and will always be, a fan of the National Football League team representing The District. I say this not to take a stand against the Redskins nickname, as has become so fashionable, but because I’ll support them regardless of what they’re named. Unless it’s something stupid, like Wizards. I’ve gone back and forth on the matter and ultimately believe that the franchise should not change its nickname — but that doesn’t mean that I don’t think the “Redskins” nickname is racist. It would be disappointing to see the name changed for my own selfish, emotional reasons, but anyone who makes judgments with their heart and not their brain is a fool. The burgundy and gold is part of my identity as a Washingtonian, and the rivalry with that team in Dallas only exists in the first place because of American nostalgia for the Old West and the cowboy-Indian dynamic. The NFL recognises the importance of the Redskins-Cowboys rivalry and realigned the divisions in 2002 to keep the Cowboys in the NFC East, instead of a more geographically-appropriate team like the Carolina Panthers. Or did you think Dallas is near New York, Philly, and DC? White people love being offended on behalf of others. When one’s racial history includes forced enslavement of one race, forced migration of another, and forced internment of yet another, it’s easy to see why many white people in the United States feel guilty for the actions of generations past. However, what matters is not what white Americans and American society in general thinks, but how Native Americans perceive the moniker. Polls vary greatly, so public opinion doesn’t offer any conclusive evidence as to whether Native Americans find “Redskins” offensive. In a vacuum, “Redskins” sounds about as racist to me as “wetbacks”. You might be racist if you don’t see how the nickname could be construed that way. It’s a word that seems to represent the “us versus them” mentality of Manifest Destiny and the wars in pursuit thereof. However, we do not live in a vacuum, and the origins, current usage, and context of other sports nicknames does matter, and must be considered in this debate. As ‘Skins owner Dan Snyder pointed out in a letter to season ticket holders yesterday, when the franchise was named the Redskins in 1933, the head coach and four players were Native American. When the team’s current logo was designed in 1971, it was done in concert with the Red Cloud Athletic Fund on the Pine Ridge Reservation in South Dakota — the Fund would later honour the organisation with a commemorative plaque. Stoic and dignified, the Redskins logo hardly makes a mockery of Native American heritage with a cartoonish representation like that of the Cleveland Indians, for instance. The most dangerous aspect of any future Redskins name change is the slippery-slope precedent it would establish. I joked with Steinberg on Twitter a few weeks ago that as a 6’6″ “person of height”, I was offended by the New York and San Francisco Giants. He didn’t catch the joke, most likely because he’s been working feverishly on little other than nickname hysteria. What I tweeted him foreshadowed an inevitable trend of people speaking out against other possibly offensive nicknames. It’s disturbing how thin everyone’s skin is in the 21st century Western world. Our society rewards people with certificates of completion and participation trophies, for god’s sake. Can teams be named after specific groups of people without invoking the woe-is-me bloviating of sports journalists? Notre Dame Fighting Irish: offensive, according to an editorial published today. The Washington Wizards probably offend Wiccans, though that most likely has to do with their performance on the court. I’m a registered independent who has more closely identified with the Republican Party of late due to the emergence of Congressmen like Justin Amash and Thomas Massie. I started my internship for the Cuccinelli campaign in March, while wrapping up my senior year at James Madison University. I didn’t know much about him, and I didn’t really care. Til then, I had always distanced myself from any partisan attachments, believing that official neutrality would be the safest path to a career in the Foreign Service. I threw all of that out the window because when you’re a second semester senior with no idea where if you’ll get into grad school and if you’ll get a decent summer internship, you take a bird when it’s in the hand. Almost any bird. The more I found out about Cuccinelli, the more troubled I was that I was working for him. My discontent didn’t outwardly affect my ability to do my job, mainly involving polling, but I was quite frustrated — my character and reputation are important to me, and by advocating his candidacy to potential voters, I was lying. I spoke to a lot of disenchanted Republicans who echoed similar sentiment, saying that Cuccinelli is simply too extreme and they wanted Bill Bolling instead. The Republican Party is at a crux. This election is not just about Virginia, it is a referendum on the national viability of extreme-right social conservatism. In an election with two distasteful candidates, Virginians have a choice on 5 November: would you prefer the Left boot or the Right boot on your windpipe? Both major party candidates unapologetically advocate policies that will abridge the rights of Virginians. How is the voting public supposed to decide which mule to back when one party is deeply divided about their candidate and the other party supports theirs only reluctantly? That is the black-and-white reality of this election; Libertarian candidate Robert Sarvis is polling at around 10% and it would be a shock if he somehow wrested victory from the clutches of the moneyed political elite… And a shock is exactly what we need. A vote for Sarvis is not a waste. 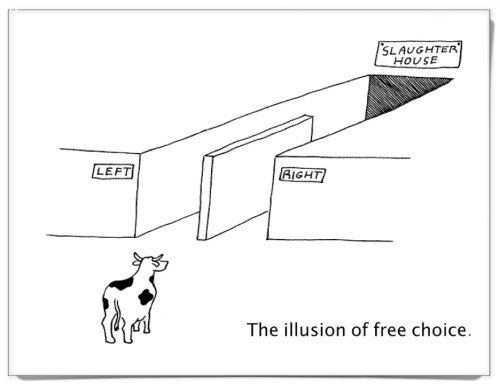 I have long disdained the two-party system because it discourages independent thought and each party pushes further and further to the fringe of the political spectrum. It’s been interesting living in the Netherlands having the opportunity to follow the recent German elections so closely. Partisanship is higher in Germany than it is in the US, and fewer voters consider themselves independent because there are enough parties to reflect most people’s interests. As a result, German parties form coalitions and the policies implemented tend to reflect the will of more than just 51% of the population. It’s important to remember that politicians are more than their platform, they are people. Politicians are opportunists and often sacrifice principle for opportunity. Most want to be not to do. That seems especially pronounced in this election — they want the title, the benefits, the deference, the power. The electorate needs to examine the candidates and evaluate their motives for running. Has anyone ever gotten the feeling that Sarvis is in this for himself?? I don’t know Robert Sarvis, and I’ve never spoken with Robert Sarvis, but I know a man of principles when I see one. Sarvis stands for the values we say we cherish — personal liberty, equality under the law, justice, and opportunity. But how much do they really mean to us if we don’t vote for them? If you need more background on him I recommend reading this article. What do Cuccinelli and McAuliffe stand for by themselves? Both are big-government crony capitalists, ostensibly not for any particular philosophical belief about the role government should play in the market, but for the circle of back-scratching that occurs when politicians subsidise big businesses. The importance of justifying one’s beliefs cannot be overstated, yet voters haven’t sufficiently gotten that from either of them. McAuliffe is a carpet-bagging Cheshire Cat who stands for nothing but his own personal interests; Cuccinelli is a totalitarian religious zealot. One’s religion and desire to preserve status quo cannot be sufficient foundations of policy in a secular government. If this election were decided by a cadre of political philosophers, it’d be Sarvis in a landslide. Republicans and Democrats are so concerned about the damage Sarvis can do them that they have deliberately taken every measure possible to keep him out of debates. They condescend the public, dismissively saying that a ballot cast for Sarvis is a ballot wasted. In reality, most of the Sarvis supporters wouldn’t be voicing their political opinion at all if he weren’t on the ballot. Even if he loses, your vote for Sarvis will signal to the political establishment that it’s time for a change, that both parties aren’t cutting it. If he clears the 10% threshold, the Libertarian Party is automatically on the next gubernatorial ballot, which will save the party a lot of money it had to spend this election petitioning for a spot on this year’s ballot. Virginians are clamoring for a better choice yet seem reluctant to take the jump. It’s time to stand up and vote with conviction, not with fear. It’s time to support a candidate like you whose sole motivation is to better Virginia. It’s time to vote for Robert Sarvis. I named my site after the appropriate foremost pursuits of good government, which ought to serve as the principles guiding state behaviour. Domestically, the state’s purpose is to protect the natural rights of its citizens, recognising their equality under the law and treating them justly. Rights are universal and belong to man qua man — everyone has the right to property, freedom of contract, first possession, self-defence, and restitution.1 The state lacks legitimacy when it cannot protect its citizens from domestic and foreign threats to their opportunity for self-determination. It is therefore imperative for the state to have a clear definition of what the national interests are. This sounds like a no-brainer but has increasingly become a trend in the modern international system, the nature of which is more ambiguous than it ever has been. The rise of intergovernmental and supranational entities like the United Nations, UN Security Council, and European Union has, along with other factors like the liberalisation of social norms, advances in technology and media, and spread of nuclear weapons, obfuscated governments’ ability to discern their national interest. Pursuit of the national interest often disposes the state to making unsavoury decisions in the eyes of their observers, like when a crusading democracy quietly backs a totalitarian autocracy for the benefits it receives from the relationship. In international relations, the ends justify the means by which they are achieved. Where there is neither a conflict with the national interest nor a great cost to the state, it should be a secondary objective to support justice and individual liberty abroad. Such is a risky endeavour; as it often necessitates a disturbance of stability. Stability, not peace, must be the objective of states participating in the international system because it is through stable order that states are most free to pursue their interests. “Peace” is too ambitious a goal and is incompatible with human nature; nothing is going to please everyone. I have boundless ambition to do, not to be. My life is dedicated to my country; I aspire to attain the level of influence that can improve my country’s standing on the global stage and strengthen the domestic institutions which make it unique. The United States, cast from gold, has become misshapen and lost its lustre — we need to recast our government through the hearth of justice and interests. I’m taking my first foray into political commentary for a number of reasons, paramount of which is the opportunity to present my ideas and reflections in a coherent, professional manner. (But not too professional — several levels below JSTOR but still above Tom Friedman.) If you’re going to share one thing without inhibition, share ideas. I’ll make some errors and my perspectives will evolve, but these aren’t things for which I’ll ever apologise — rather, they’ll show what I will have come to learn in the meantime. Learning is my favourite thing to do and I don’t plan on ever stopping. In general, I prefer communicating by typing. Besides the “oh my god, is that my voice? !” factor, writing makes it easier for me to clearly communicate what I’m trying to say. Thinking before I speak is very important to me, and here I can articulate something I can’t in a tweet or a quick phone chat. I also hope that writing on a regular basis will improve my ability and translate to a more polished Master’s thesis. I’ve spent years tiptoeing around taking divisive positions on the internet, where they’re on file for all eternity, cautious that my words may resurface and hinder my ability to be gainfully employed. Much of that reservation was a product of the deference I thought I had to show to make it into the US Foreign Service. This year, though, I’ve lowered the veil, and I’m using this site to discard it entirely. I’m taking advantage of the opportunity to craft my own narrative, one that won’t hold me hostage for something complicated I tried to explain in 140 characters. If you read any of my posts, which I hope you will, you’ll find that I don’t often mince words. I’m direct, and that often rubs some people the wrong way. Still, in my limited amount of experience, I’ve found that even the most timid coworkers would ultimately rather be told something without the sugar coat. A bit about me: I’m from Reston, Virginia and currently live in Maastricht, Netherlands. Prior to moving, I was a research associate at a K Street lobby, studied philosophy and political science as an undergraduate, and briefly lived in Jordan and Ghana, where I studied abroad. I guess that’s it. I felt obligated to do some sort of an introductory post before diving right in to political theory and whatnot.